� The fan blade is galvanized, reasonable blade profile angle, high strength, big wind volume,� non-deforming, non-breaking-up, without distortion, no noise,no broken,easy to be started, attractive and durable. � Adopts the best automatic belt tensioner which can adjust up and tight so that the belt�� can't pine and drop. � Adopts the best domestic axletree(bearings),high intensity, low noise, long service life.This axletree also is used in FIAT car in Italy . � Variety sizes of shape and install conveniently. � Size of shape (blade): 900mm,1000mm,1100mm,1400mm,1550mm five kinds. 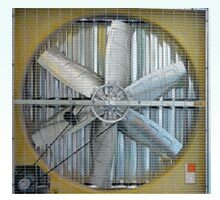 � Our fans were adjusted by advanced computer balancing tester, to smooth operating, reduce noise, enhance stability, extend service life.